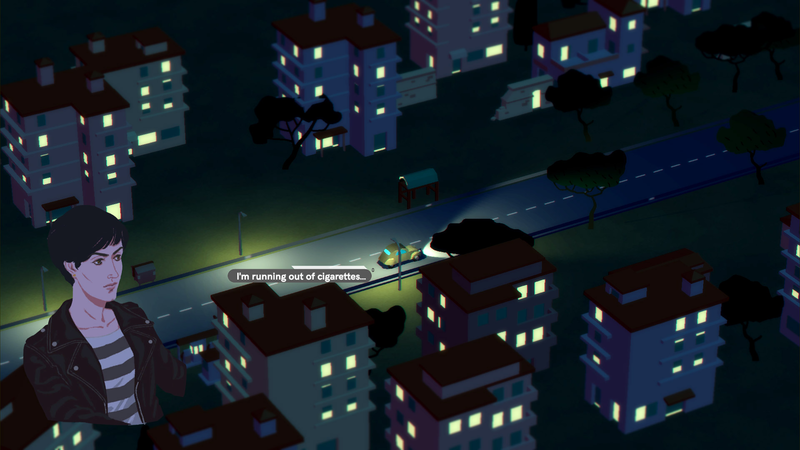 Review: Wheels of Aurelia | "DESTROY ALL FANBOYS!" Bravo, Santa Ragione and Brava, Lella! This driving sim/adventure hybrid’s a definite Game of the Year contender that will make those who “get” it want to crack open a few books and do some heavy reading and/or thinking. Score: A (95%) BUY IT! 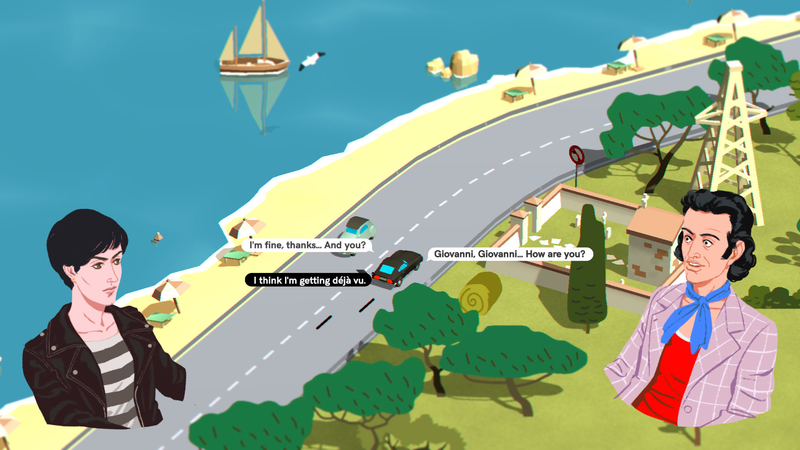 Calling Santa Ragione’s outstanding Wheels of Aurelia a simple “driving simulation” is REALLY selling it short. This brilliantly conceived hybrid game is more of a mature “choose your own path conversation-based adventure that just so happens to take place in a almost constantly moving car” with 16 possible outcomes and more than that many ways to reach them. From the beautiful stylized simplicity of the art, the great soundtrack (buy it!) that captures the spirit of late 70’s Italian radio tracks, and the mature script that may rankle a few overly sensitive types while striking others as flat out fantastic and thought-provoking. Save for the ride you choose, the game’s opening is exactly the same each time. In 1978, Lella and Olga, two young Italian ladies who met the previous evening at a disco, set out on a road trip to France on the Via Aurelia along the western coast of Italy. Along the way, the pair talk about life, pick up a hitchhiker or two (or none – it’s up to you) and based on the path both the conversation and car takes, the game reaches a conclusion in all of 15 minutes or so. 16 endings at 15 minutes each ends up at 4 hours total playtime IF you’re silly enough to think you’ll see every conversation and character variant possible. The combination of period-era history, frankly spoken dialogue and some VERY interesting hitchhikers make this very replayable as well as a great exercise in storytelling. Despite the color palette,this is NOT a kid’s game at all. Lella’s an unrepentant smoker, there’s a running plot point in all the sequences about a pregnancy and what’s to be done about it, religion gets a little fun poked at it (a little Inquisition, if you will), and so forth and so on. In a great move, the game slyly does not let you in on what occurs with most of its protagonists until you reach an ending. In fact, the fate of Lella, Olga, and a few others is all based on conversation strings, where you drive and who else may be in that car during the trip. Sometimes a character leaves and another joins, changing the game’s tone from serious to comical, then back again to serious. Other times, your journey ends abruptly thanks to being in the wrong place for Lella and the right time for a passenger. Both Lella and Olga have secrets that change up the drive you think you were going to have into a drive that just makes you think. If you’re a student of world history, the references to religious and political issues of the era will be pretty eye-opening. Not to spoil anything here, but subtle to direct mentions of personalities from the period had me hitting a search engine to play reconnect the dots. WoA is a game where the more cerebral players will see past the “Point A to Point B” stuff and enjoy it all the more because it nails so much in as few words as possible. Gameplay is simple: you “steer” with the left/right arrow keys (or left stick on a gamepad), speed up the car with the spacebar (or B on a gamepad), but you can’t turn around at all if you miss a drop point or potential passenger. The game is structured to get you to points relatively quickly, not make you backtrack. You can choose to not touch the gas at all, which makes for a more leisurely drive, but expect a few complaints about your lack of a leadfoot. Lella’s conversation stings are handled with the up and down arrows (or up/down on the pad). You have a few seconds to choose one of at least three responses, one of which is silence (which isn’t always, golden, mind you). Her replies range from serious to sarcastic and give an insight to her as a person while also opening up one of the reasons she’s in that car in the first place. Both she and Olga have their reasons for traveling to France as Aurelia becomes the road to a few things along the way. Paradise, Redemption, Revenge and more, or all those films Bing Crosby and Bob Hope never got around to making. Then again, Dorothy Lamour would make a terrible Lella, I’d bet. Too damn cheery with the songs and sarongs and whatnot. 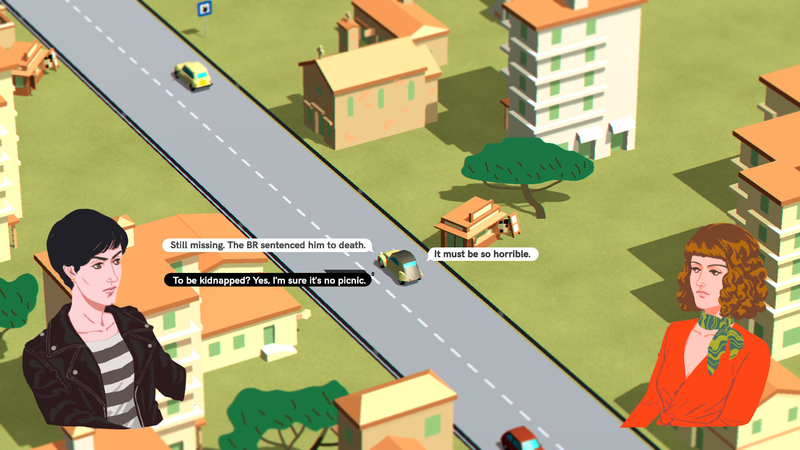 In a neat touch, you can earn bonus cars in the game based on who you pick up and what happens. Not to spoil anything here, but there are times where Lella completes a story with a different ride than the one she starts out in. Sometimes this makes for amusing transitions and yes, it’s nice to see another little car on screen when you start a new story up. While not licensed vehicles, it’s easy for car buffs to point out what they’re supposed to be and I’m sure the game’s Steam forum will get a list sooner than later of guesses. Of course, that’s good for the dev team, as it means the game is selling well enough that players get to do that guessing. The lovely art and catchy tunes keep the conversation flowing even with the car banging into the occasional barrier or other vehicles. This isn’t a “true” simulation at all as you don’t see damage and other than a few not so consistent complaints about Lella’s driving, you’re not going to end up crashing through a barricade into the sea or end up upside down in flaming wreckage as far as the endings I’ve gotten show. There are races to compete in here as well as at least one police chase. However, those outcomes seem predetermined based on who your passenger is more than your steering and acceleration skills. Nevertheless, he game is always captivating and reaching those endings makes each short trip worth it. If there’s a flaw here, it’s the limits to the dialog trees. As you only have a few seconds to choose Lella’s responses, they needed to be more concise so players wouldn’t be scrolling through choices and run out of time. Also, some of her lines repeat at odd moments or you’ll see a choice pop up that changes the subject simply because the other options are have been used and you’re stuck with going deadly serious just to hear the response. That said, overall, the game works well enough that these are minor gripes at best. So yes, definitely thumb a ride with Lella and Olga and go learn a bit about them (or not) before you reach your destination (or somewhere else she drops you off because that’s how she rolls sometimes). 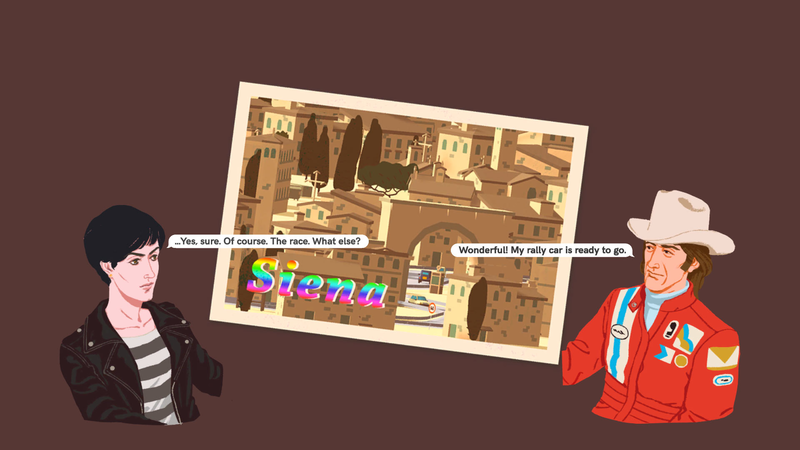 Wheels of Aurelia is a superb indie masterpiece that needs to be played multiple times and kept in your library just to show off how the medium can be used to entertain outside of merely running around putting bullet holes in everything as a main plot point. 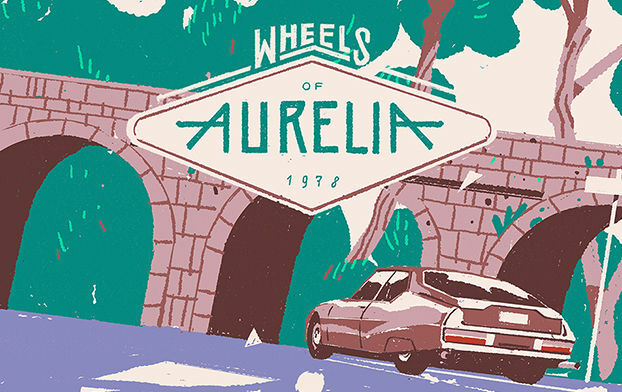 This entry was posted in 2016, Commentary, DAF, Features, Humor, Updates and tagged #wheelsofaurelia, BUY This Game, Gallery, Linux, Mac, Microsoft, PC, PC Games, PlayStation 4, Playstation Network, PS4, PSN, Reviews, Santa Ragione, Screenshots, Sony, STEAM, Valve, VGA 101, Videogame Appreciation 101, Videogame Reviews, Videogame Trailers, Wheels of Aurelia, Xbox Live, YouTube by geelw. Bookmark the permalink.